This time of year, our woodstove is going pretty much 24/7 up at the cabin on Powell Lake. That is especially true this winter with sub-zero temperatures day and night. 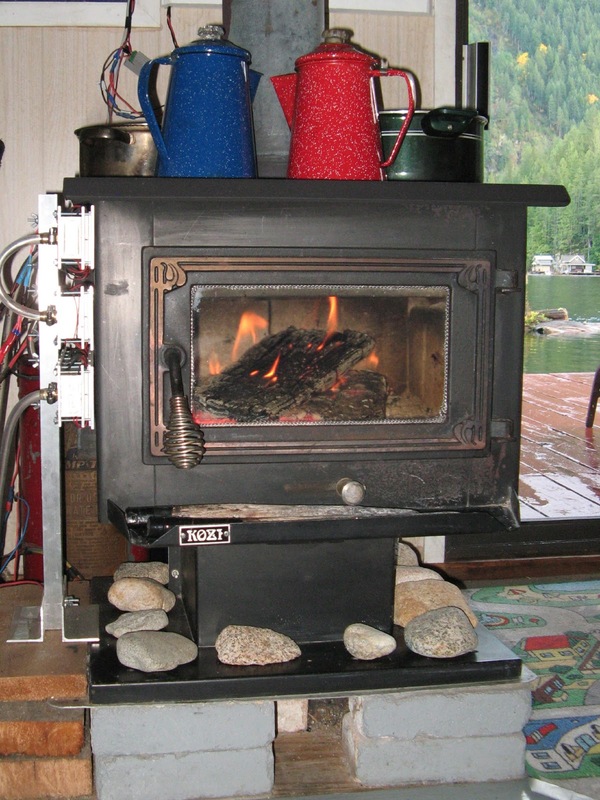 Our woodstove is the "heart" of our float cabin home. Without its warmth, we couldn't live here in all seasons. Our stove is a KOZI. KOZI still makes wood and pellet stoves, but our model is what I lovingly call a classic. It came with our cabin when we purchased it in 2001, and has served us well ever since. On top you will find pots of water heating and coffee perking. You might even find a pot of chili cooking. Potatoes baking inside the woodstove firebox. But there are lots more ways to cook using a wood heating stove. This week we used the inside of our firebox to bake potatoes for dinner. It's so easy. Just wrap a spud in aluminum foil and place it on the ledge inside the door. To keep an eye on the temperature inside, I used my Imperial thermometer. I was surprised to see it get up to 500 degrees inside. That's a hot fire, enough to cook my home grown potatoes in less than an hour. I never cooked inside our woodstove, although I heated things on the top when the power was out. When I was in high school, we lived in a then-remote area (not so any more) with no electricity. Mom stored things in the oven of the electric stove, and cooked on top of an old pot-bellied stove. She could even make cakes on top of it! I was content, however, to let her do all the cooking until the electricity arrived. Then I took on bread-baking...12 loaves every Saturday until, the day after I graduated, Dad moved us down off the mountain and out to the wet coast. It was fun while it lasted, because I was very young. I'm supposed to be making soup after defrosting one container of turkey bits-and-broth today. My arthritic hands ache a the thought of it. It's fun to read about the adventures you and Wayne have up at the lake, but better thee than me, my friend! If I haven't already said this: "Happy New Year!" and if I have, well, saying it twice makes it extra nice. OH I love woodstove cooking - now I just need to get a woodstove again. We had one in an old school house in N. California - I almost always had a pot of water on for hot tea - and of course chili and soups simmering on the top. I'd never done baked potatoes - wish I'd known about that - would have been fun. Thanks for sharing at Simple Homestead Blog Hop.